MDT-2 with quick-load Teflon® base and external scale. Compared with the MDT-1, the MDT-2 features bright dynamic color graphics, touchscreen control, improved computational capabilities, longer battery life, enhanced USB and Ethernet connectivity, and a number of other new and/or improved features. MDT Quick Buttons™. The MDT makes it easy to test a fruit multiple times. Press green to test a new fruit or press yellow to test the same fruit again. If you have trouble with a test, press red to abort. The MDT keeps track of everything and gives you individual and average test data for each fruit as you test. The group of researchers currently led by Dr. Katherine (Kate) Evans at the Washington State University's Tree Fruit Research program use the Mohr MDT tester in their evaluation of new cultivars. Their most recent success is the WA 38, soon to be marketed as the Cosmic Crisp® apple. There are a number of plungers and other attachments available for testing many different materials. Custom fixtures, plungers, and other attachments can be fabricated on an affordable time and materials basis. We also offer a range of load cell sensitivities for working in specific force ranges. 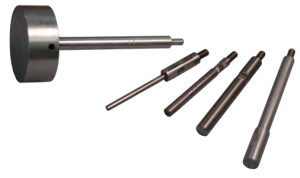 Example MDT probes (L-R: general compression, 4.7 mm, 8 mm pear, 11 mm apple, cherry probes). Numerous interchangeable probes and fixtures make it easy to test anything: fruit, vegetables, other food products, plastics, textiles, etc. 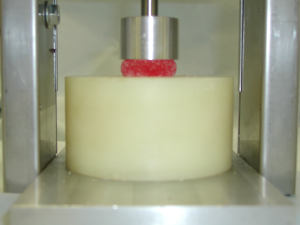 MDT rheology plunger during testing of a thixotropic material (pie filling). 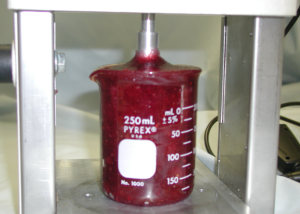 Test protocol involves measurement of viscosity hysteresis at multiple different shear rates. MDT using compression plunger to test a gumdrop candy. This test protocol involved both creep strain deformation and constant-rate compression testing. MDT external scale / calibrator. Use the scale to weigh fruit or place it under the test head and let the MDT-2 calibrate itself. 42.0(H) x 17.8(W) x 20.3(L) cm. 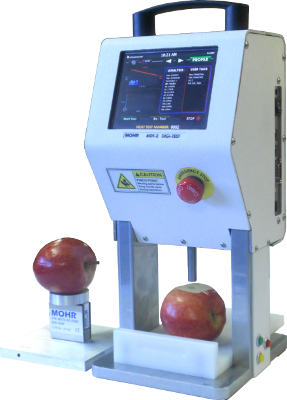 Mohr Digi-Test (MDT) Series instruments are portable materials testers designed to accurately characterize the texture and firmness of fruit, vegetables, and other agricultural produce in the field, packing house, and the laboratory. The MDT-1 is in active use by prominent fresh produce industry and research organizations. The new MDT-2 builds on the capabilities of the MDT-1 with a number of next-generation enhancements. Fast testing: The MDT can test faster than you can physically keep up (25+ tests/minute). Automated reports: All data is immediately tabulated and exported in customizable reports, viewable anywhere over a LAN or the internet. Barcode scanning: No more writing or entering information, including identification info! This can all be barcoded and is handled automatically by the MDT. Diameter / weight: The MDT records these parameters automatically. Integrated test data: MDT software allows any kind of fruit test data to be barcoded in (titrable acidity, soluble solids, color, etc.) with the same high efficiency as MDT test data. These are included in your automated reports, too. Network integration: Fruit test data is available immediately over the network. Portability: The MDT is lightweight, battery powered and designed to be used anywhere. Use it in the lab and then throw it in your truck for field use or carry it into the packing house. Ease of Use: We know you are busy and don't have the time or energy to figure out a new instrument. One button press gets you testing. Repeatable, accurate results: Effegi and Magness-Taylor fruit tester data is easy to "fudge" and even with careful use can vary widely from operator to operator. The MDT is always accurate to within 0.01 lb, no matter who is using it. Complete fruit maturity data: The MDT gives you external fruit pressure, internal fruit pressure, crispness (analagous to the crunch you experience when biting a fruit), and creep deformation (how viscous the fruit material is under constant pressure, indicating loss of cellular integrity), and also gives you the Quality Factor (QF), a weighted summation of all these test parameters, customized for each fruit type and scaled to 100 for optimum picking and 0 for the limit of consumer acceptability. For a complete description of MDT test parameters, please read the paper referenced below on Apple Maturity. Instant statistics: Ever wonder what the "bell-curve" of your fruit looks like? The MDT gives you mean and standard deviation you as you test. Follow along on the MDT Server desktop software and see the histogram of fruit quality from multiple different testers. 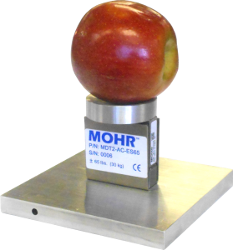 The Mohr Digi-Test (MDT) Computerized Agricultural Penetrometer as an Apple Maturity Tool. MDT test results described in detail. Apple Quality Testing in Five Market Centers Using the MDT-1 Agricultural Penetrometer. Describes a comprehensive retail fruit quality test program carried out in a multistate region using the MDT. The MDT has a wide range of test capabilities and features that few other instruments offer. From its ability to perform complicated velocity and position-dependent tests (such as creep strain and thixotropic viscosity measurements) with sampling rates up to 1 kHz to its integrated barcode scanning and Ethernet capability, the MDT is in a class by itself. Read below for more information. MDT Server software allows all of your test data to be barcode-entered and tracked along with MDT texture test data in a single MySQL® relational database that can produce customizable automated reports ready to print, e-mail, or post to the web. Single or multiple users with either a notebook computer or an MDT can simultaneously view, add, and edit texture data in a central database. For purchasing options, please visit our How to Buy page.